Don’t fight Monday – Your calling is calling. Well, a recruitment company would say that wouldn’t they, to all workers reluctant to rise and start the new week. Agency BBDO came up with an epic idea for the 60-second spot Daybreak to promote Monster.com, a web company that puts potential employers and employees in touch with one another. 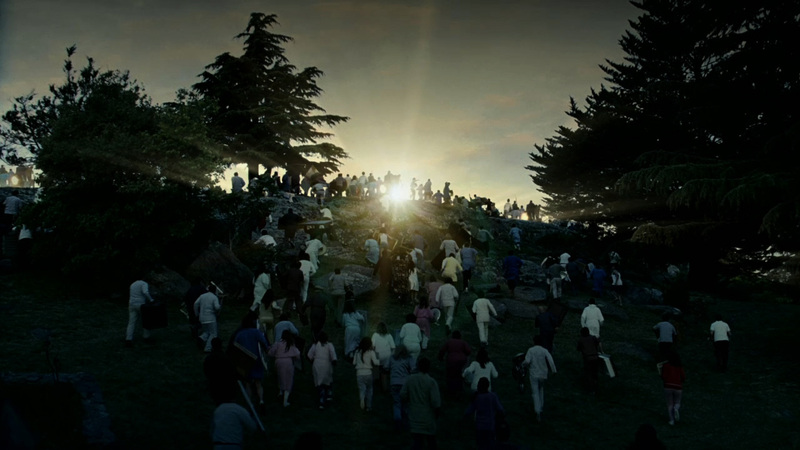 The Mill was glad their first job for Monster.com was to be directed by the Danish commercial director Nicolai Fuglsig. Formerly a photo journalist, Nicolai is no stranger to real battles, nor to creating epic scenes. For Daybreak, virtually all the workers of an Argentinian town were woken from their pre-dawn slumbers to rush up to the top of the highest hill, each one grasping some flattish domestic object as a shield to hold back the rising sun. Inevitably, the all mighty sunlight overpowers their shield wall and the townsfolk resignedly accept another Monday morning. Lead Flame artist, Angus Kneale, says, "The overall challenge for us at The Mill was to create an epic look and feel without making it look glitzy or supernatural. We aimed for a slightly stylised battle sequence without allowing it to appear at all otherworldly."